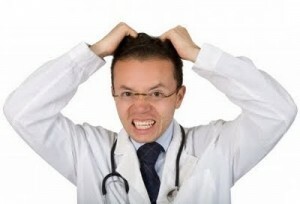 Dr.Malpani's Blog: Why do doctors get irritated by patient's questions ? Why do doctors get irritated by patient's questions ? Most patients believe that doctors don't like to be questioned . Many get irritated when the patient asks too many questions and this is very obvious - both from their conversation as well as their body language . The doctor wants to move on with the consultation , and feels that having to answer what he feels are irrelevant questions from the patient is a waste of time for him . Why are doctors reluctant to answer questions ? One reason is that it takes time to answer queries, and doctors are busy people . The more the time he spends on answering questions, the less the time he has to see other patients . Doctors have mastered techniques to maximize their efficiency and will do their best so they can move on to the next patient ! You, on the other hand, want your doctor to answer all your queries. You know how precious his time is - after all, it's taken you for weeks to get an appointment to finally see him ! You don't know which queries are relevant and which of your concerns are medically important, which is why you have a long list of questions - after all, it may take months before you may get a chance to see your doctor again. Doctors are reasonable people, and understand your concerns . They'd be quite happy to answer your important queries and field the others for some other day , especially when he is running late ! However, what really irritates doctors is that lots of patients will think nothing of asking questions about their uncle's blood pressure - questions which just end up causing the doctor's blood pressure to rise, because he's busy. Sometimes doctors get irritated because the questions are completely irrelevant and just show that the patient is completely misinformed. This can be quite frustrating, because doctors would rather deal with intelligent patients , who have taken the time and trouble to do their homework before coming to see them . At the other end of the spectrum are patients who irritate doctors because they come with a long generic laundry list of questions which they have printed from the Internet . While it's good to have a checklist of questions , before you subject your doctor to an inquisition, the least you can do is try to figure out the answers for some of them for yourself. Asking the right questions is an important part of medical treatment. Your doctor is there to answer your questions and encourage you to ask them, but in order to get the most out of your time with a physician, you should focus on asking the right questions rather than as many questions as you can think of. The answers to a lot of questions are available online - and if you take the time and trouble to research these before your consultation. you will be able to ensure that your doctor can deal specifically with the particulars of your case, thus allowing you to make more efficient use of his time , without getting bogged down asking generic questions. Finally , there are some doctors who may feel threatened by their patient's questions . They may feel that patient knows too much - more than even they do . This creates a feeling of insecurity, especially when then they know that they are not as well-informed as they are supposed to be . It's not humanly possible for a doctor to be a specialist in everything - and this is specially true if you are a family physician . Rather than being honest and upfront with the patient , some doctors will try to brush off these questions. They will often do this in a disparaging manner , and some will put the patient in his place by saying things like - A little knowledge is dangerous; or - Don't try to become a half-baked doctor ! ; or - You don't need to bother your head about all these trifles - I will take care of you ! Good doctors encourage questions . They understand that medicine is not a perfect science ; that outcomes are always uncertain ; and that the more the patient is engaged in his care , the better the outcome is going to be - both for the patient and the doctor. However, if the quality of the questions is poor, any doctor , no matter how good he may be , is likely to get irritated and put off . Therefore , if you feel that your doctor is getting irritated by your questions , you need to ask yourself - Is there a problem with the doctor ? or - Is there a problem with me ? Am I asking poor questions ? The solution may be to work on improving the quality of your questions , and presenting these to your doctor in the manner he prefers. While it's true that some doctors may feel threatened , because this is not their style of practicing medicine . They are used to unquestioning obedience - from nurses , assistants and patients ! They are not accustomed to the patient asking them questions , because of the paternalistic style of medicine which they have been taught - and which they have practiced successfully for many years. They they may feel that the patient is challenging their authority , and may get agitated and upset when the patient asks too many questions. Fortunately, this older generation of doctors is gradually passing away, and most young doctors take a much more enlightened approach towards answering the patient's questions. Th smarter ones are using technology ( such as online FAQs and youtube videos) to answer their patient's common questions, so that they don't have to repeat the answers for each patient !